In the present study an attempt was been made to assess the air pollution effect on micromorphological and biochemical parameters of Pentas lanceolata and Cassia siamea. 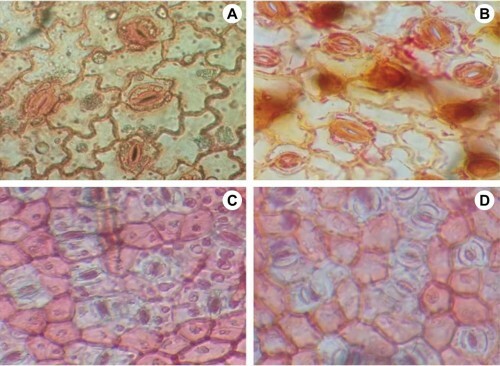 There was a decrease in number of stomata in P. lanceolata of the polluted site compared to control but in C. siamea numbers of stomata were increased in the polluted area when compared to control. The number of clogged stomata was less in control area samples when compared to polluted sample. A number of epidermal cells in C. siamea of polluted and control sites showed a significant difference. Stomatal index of both species was found to be reduced in polluted site when compared to control. Leaf surface area in both the plant species decreased from control to polluted area and leaf colour changes from green to pale yellow/dark in a polluted area of both the plant species. Chlorophyll a, b and total chlorophyll content in both the plants were found to be significantly different in control and polluted plants. Ascorbic acid, relative water content, pH and Air Pollution Tolerance index was found to be significantly different between control and polluted plants. Based on the present study results two plant species i.e., P. lanceolata and C. siamea are categorized in to intermediate and sensitive respectively. Thus they can be considered as bio indicators of air pollution. Fig. : Microphotographs of stomata of leaf sample from polluted and control areas of Pentas lanceolata and Cassia siamea.